We want to believe we can experience God through the Bible . . . But our good intentions fall flat when the Bible just doesnt seem to do that thing for us. What should feel dynamic and important and alive often feels confusing and boring and irrelevant. But it doesnt have to be that way. In Help! My Bible is Alive!, pastor and Bible teacher Nicole Unice brings life back to Bible reading by helping you encounter God personally through his Word. With Help! My Bible Is Alive!, youll learn to . . .
find practical principles as you read parables, poetry, narratives, ancient letters, and wisdom literature. Take this 30-day challenge and develop the habits you need to sustain a vibrant spiritual life where the Word of God is alive and active in your life. I'm the author/artist and I want to review Help! 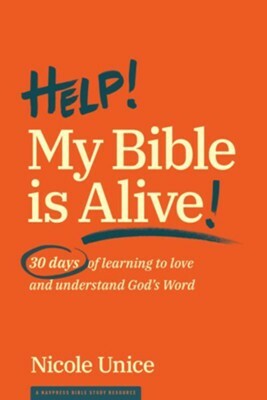 My Bible Is Alive: 30 Days of Learning to Love & Understand God's Word.